For the first time, they have glimpsed behind the veil that covers the ‘Big Bang’ with the announcement that the Background Imaging of Cosmic Extragalactic Polarisation – BICEP2 – experiment at the South Pole had spotted the footprints of something called primordial gravitational waves. These waves may be a sign that a theory known as cosmic inflation can be confirmed. For those studying the Big Bang – the beginning of the Universe – this is big news. Einstein believed that gravitational waves – a kind of ripple in space-time – did exist and the findings at the South Pole appear to confirm his theory. The big announcement came just months ahead of this autumn’s release of polarisation data from the European Space Agency’s Planck satellite. Both BICEP2 and Planck studied a relic of the Big Bang known as the cosmic microwave background. The question now is whether the gravitational waves signal really did come from the dramatic first instants of the Universe – the period known as inflation – or did they come from somewhere else? Some scientists have suggested that BICEP2 was misled by interferences such as galactic dust. The reason for the excitement in the cosmology world is that gravitational waves could teach us a lot about the Universe. With the VIRGO interferometer at the European Gravitational Observatory near Pisa, scientists are trying to detect those waves. They are setting up an experiment in a three kilometre long tunnel. There are two tunnels perpendicular one to another, and in each one is a light beam from the central building to the end tower, where the light is reflected and goes back to the central building. The aim is to detect a gravitational wave. In theory, a wave passing through the Earth would stretch the tunnels, changing the time the light needs to make a round trip between the mirrors. The researchers are not looking for anything big – the stretch is very, very tiny, about one thousandth of the size of a proton. Studying the Universe with gravitational waves can bring about a wealth of new data. Produced mostly by catastrophic events like collisions of black holes, these waves are completely different in their nature from electromagnetic radiation. It is like adding sound to our image of the Universe. Of course, launching experiments into space to spot gravitational waves is one way to avoid Earth’s noisy environment. Set for launch in 20 years, the European Space Agency’s LISA mission will have its mirrors spread wide apart in order to improve the sensitivity of measurements. LISAis a constellation of three satellites, separated by about one million kilometres. The trio of satellites, linked by a precisely aligned laser beam, will follow the earth at a calculated distance to balance out the gravitational forces. When LISA is launched and operating, it will be the largest man-made thing ever. In the sense that the million kilometres is about something like 2.5 times the distance to the moon, that’s the separation of the satellites. And the relative distance between the satellites is measured to a few picometres – about one hundredth of the size of an atom – over the one million kilometres. A pathfinder mission aims to prove the concept next year, and a full scale LISAobservatory is planned for 2034. 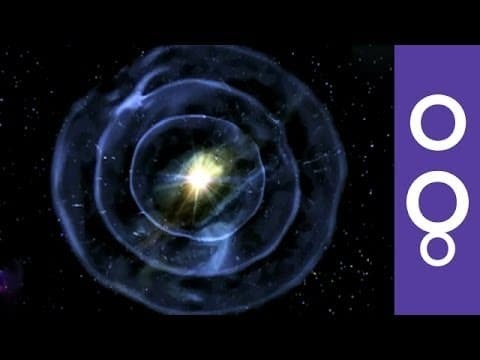 We are about to hear the cosmic symphony – from the pulsation of neutron stars back to the first echoes of the Big Bang.